We have a talented team of face & body painters, balloon twisters and character entertainers that would love to join you at your next party or event in and around Canterbury. They are used to working private birthday parties, face painting for individual sittings and engaging the public at corporate events and always get fabulous feedback doing so. Enjoy looking over their work below and drop us a line should you wish to have them join you! Along with working for Fab Faces, I'm also a photographer, a vocalist and mother of three. My own children LOVE to dress up, and face painting is the ultimate way to climb into character. I began face painting when my oldest was little and found it a fabulous outlet for creativity. We had heaps of fun, but I was frustrated with the limits of regular paints. Since then I've built up a kit of professional paints, attended workshops and gained a lot of experience. Imagination is the only limitation now! I love to face paint and have been really enjoying meeting all you lovely people out there in Christchurch. My favourite moment would have to be when each child sees their 'new' face in the mirror for the first time. It's magic! I hope to join you to share the magic of face painting and balloon twisting soon! The talented Stephanie came to my son's 1st birthday circus party and did an amazing job. She created beautiful art work on faces and arms, and thoughtfully created gorgeous circus themed pictures on my nieces faces. 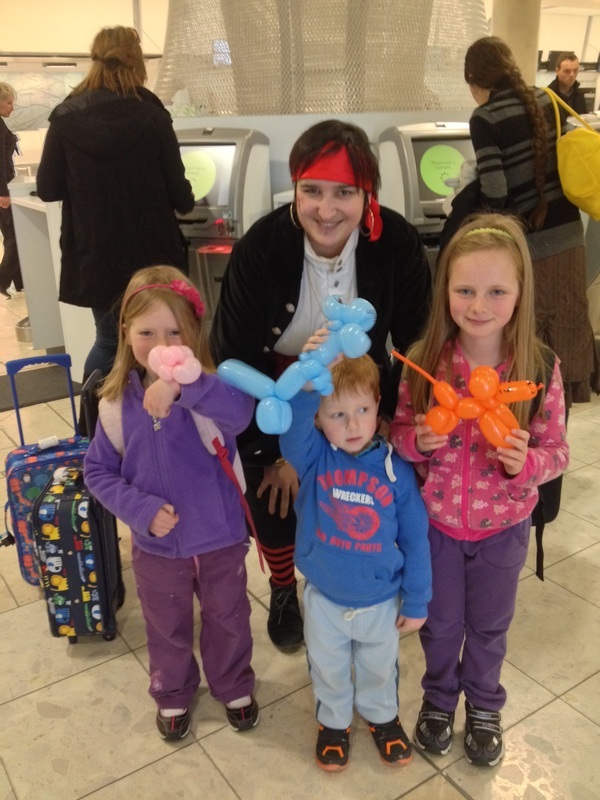 Her balloon work was fabulous and all the children loved watching her unravel her amazing creations! Stephanie was just wonderful with the children and had a fabulous rapport. She is very professional in all aspects and works very hard to make your day so truly special! Thank you Fab Faces and Stephaine for making Weston's party that extra fabulous! I just wanted to let you know how fantastic Stephanie was at Kate's 5th birthday!! Stevi was so friendly, professional and just lovely to deal with. Her face painting was outstanding and all the children looked amazing!! All and all, Fab Faces have been wonderful to deal with and I will without hesitation be recommending Stevi and Fab Faces to my friends. Thanks again Sarah, for helping to make Kate's day even more memorable. "Hi Sarah, I just wanted to let you know that we were all so impressed with Stevi at the weekend, she was absolutely brilliant and within all the chaos she just mingled in the background making the kids all happy. So thank you very much for sending her round, she was just brilliant. Thanks again, Vicky"
I've always been into drawing, and learned to face paint in 2013 during my time at D&A's makeup course, where I graduated as 'Student of the Year'. Since then I've been doing a lot of face painting, body painting, makeup and special effects, and have attended more classes as well as learning a lot from fellow painters! I'll give any face paint design a try! I love the original ideas kids come up with, and it's great to see their faces when they see their ideas come to life. I also twist balloons, and recently started entertaining as a pirate. I have a pretty convincing pirate accent, can spin a good yarn and even know a few sea shanties! My other work involves photography and photo-manipulation, and I am also studying fashion design this year. Basically I'm addicted to creating, and love learning new things! I think that's the major appeal of face painting; because every kid has a different request, it keeps me on my toes. I have always been a very creative person with a wild imagination and love of dressing up and creating costumes. I have found that face painting and body art allows me to share this passion with a range of age groups and help people to transform into anything their imagination can come up with! I love to see how children react when they first see their face paint and I love the challenge of painting a request I have never had before. When I’m not working for Fab Faces I’m a qualified and experienced preschool teacher based at a centre in Rolleston – just south of Christchurch. I started out painting the children at work whenever we had preschool events or holidays but soon started getting requests to paint at the children’s birthday parties on weekends. I started to invest in a professional kit, which grows by the week, as well as get in touch with other like-minded artists and recently attended a body art convention in Wellington (BARC) which was amazing and extremely inspiring! I have also learnt the art of glitter tattoos and balloon twisting which are both so much fun and total child-magnets! I can also come to your party or event dressed in full fairy costume for character entertainment – and am open to requests for any other characters you may be after. I look forward to meeting you and making your party or event super special and memorable! "Fantastic at what she does!!! Highly recommended :)"
"Casey does an amazing job on children's face painting, I would definitely recommend" her. "Awesome job on face painting, not your everyday job, great detail! Thanks heaps for the party Casey, CJ was very happy!"